"Jewish Pink Elephant" by Rich Dweck: "STUDY: It Actually Does Get Better For Gay Teens — Bullying Decreases With Age"
"STUDY: It Actually Does Get Better For Gay Teens — Bullying Decreases With Age"
A new study out of England suggests that bullying decreases for lesbian, gay and bisexual youth as they get older, although they still face higher rates of harassment than their heterosexual peers. The study, which was published today in Pediatrics, found that regardless of gender or sexual identity, bullying experienced in adolescence decreases for all students with age. Researchers analyzed data collected from 4,135 teens and young adults in England over seven years. At ages 18-20, about 5% self-identified as lesbian, gay or bisexual. Researchers looked back at their responses at earlier ages and found 57% of lesbian and bisexual girls said they were bullied at ages 13-14, vs. 6% at 18-20. And 52% of gay and bisexual boys were bullied at 13-14, vs. 9% at 18-20. Among those who self-identified as heterosexual, 40% of girls said they were bullied at 13-14, vs. 5% at 18-20. And 38% of boys reported being bullied at 13-14, vs. 2% at 18-20. Researchers claim the same results would likely be found in the United States as well. Robinson suggests that the disparity between gay males and females may reflect the fact that masculine tendencies in girls and women are more culturally acceptable than femininity in boys and men. 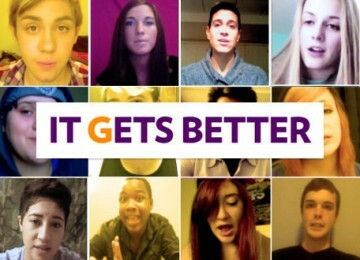 Dan Savage, who founded the It Gets Better Project to combat anti-gay bullying, agreed. “A lot of the disgust that people feel when you bring up homosexuality … centers around gay male sexuality,” Savage, who was not involved in the study, told the Associated Press, adding that “there’s more of a comfort level” around gay women. Robinson partially attributes higher rates of emotional distress — such as unhappiness, depression and low self-esteem — among LGB youth in comparison to their heterosexual peers to bullying, but suggests that “broader issues of school and societal messages” also need to be addressed. The British study mirrors findings by the Gay, Lesbian & Straight Education Network, whose Executive Director Eliza Byard said that bullying is more common in U.S. middle schools than in high schools. Kendall Johnson, a 21-year-old junior at the University of Illinois, recalls being bullied in high school, particularly when he brought his boyfriends to school dances and football games, but he hasn’t had any problems in college. While he hangs out with the theater kids and avoids frat boys, Johnson agrees that it generally gets better for LGB youth with age.